There are some gadgets that will facilitate applying make-up and help to take better care of your skin. Eyebrow trimmer, a spatula for applying face cream, and many more. Check out what else have stylist invented, in order to facilitate their work. Maybe you will find such tools useful in your own make-up and skin care routines. This product is especially essential if you just begun styling your brows. You can choose from a variety of shapes and sizes. Pick the one that will improve your look and emphasize your eyes. Keep in mind that properly styled hair will enhance your face. How to use eyebrow stencils? First of all, press the form against your skin and using an eyeshadow, liner or eyebrow powder, outline the contour of your brows. Next, using the same product, draw short, thin lines that will imitate brows. For better results, use two products in two different shades, a lighter and a darkener one. Thanks to this, your brow arch will look more natural. It is a small tool used for applying foundations, creams, concealers, bases, balms or even self-tanners. The applicator distributes and blends in your cosmetics at the same time. The sponge ensures smooth application, while the product evens out the skin tone, hydrates, firms and massages. It is another gadget that will facilitate the process of cleaning your make-up brushes. Mats come in different shapes and sizes. How to use it? It is very simple. Firstly, dampen it. Then, apply a small amount of make-up remover or face cleansing gel. Next, dampen your brush and then gently rub it against the textured part of the mat. Do it with caution, try not to damage the bristles. Later, rinse your brushes and leave them upside down to air dry. Wash the matt thoroughly and wipe with a paper towel. It is a number one hit in the cosmetic industry. Girls who cannot survive a day without make-up are probably the biggest fans. 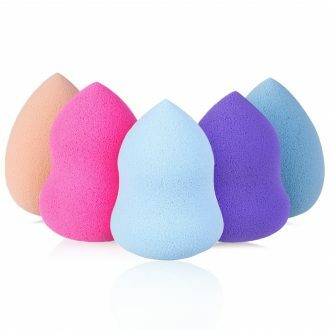 This sponge allows to distribute foundation evenly all over your face. What is more, it is also useful for applying concealers and face creams. You can choose from different colours, shapes and sizes. This egg-like shape will facilitate the application of the foundation in hard to reach places (for example your nose, lip corners or under eyes). Thanks to this tool, you will avoid the effect of a cake face and prevent smudges and stains.